Andrea’s new favorite scarf… these lovelies are huge, soft, and GORGEOUS! It just hugs your head so lovingly, and the colors remind us of our favorite impressionist paintings. Every time you wear it, depending on how it’s folded, it will look different. It may never make its way back into your closet because you’ll be wearing it so often! This scarf is an absolute dream to wrap! It layers nicely and looks great on its own! It’s light enough to wear in the summer too! This scarf won’t go anywhere once you put it where you want it! I just love it! It makes me feel like I’m in a Monet painting. Absolutely stunning! This is one of my favorites. It really is wonderful in every way. Easy on the eyes. Easy to play with. Perfect for warm days. Purchased two a couple years ago, wear them often, and they still look new. Definitely recommend. My only complaint with this scarf is that is has replaced my signature scarf as my favorite scarf. I love it. It is huge so instead of folding it to fit my head I just fold it in half which gives me great coverage over my whole head. I have the green/blue color and it goes with most of my wardrobe. It doesn’t have fringies so I don’t have to have my daughter “tuck me in” as I always ask her to to. Even though I fold it in half it still is very light weight and I can wear it over another scarf for a beautiful look ( I live in a hotter climate). I might even wear tails with this scarf which I have NEVER worn. I tried it once, I didn’t wear it out but it looks good and it didn’t bother my neck. I have this scarf in both the blue green and the red. It is perfect for summer wraps and the pattern makes every pleat and fold look awesome. My favorite summer scarf. I hope it’s brought back next year! This scarf is so amazing! You can layer it with accent colors or wear it on its own! It’s soft and easy to wrap. My favorite scarf so far. Very lightweight, goes with any shade of green or blue, easy to tie. This scarf is AMAZING ~ The color merge together so beautifully and it’s an menagerie of colorful gorgeousness!! All of my favorite colors in one scarf. I am going to purchase another one only because I’m afraid that if something happens to it I’ll be so disappointed. It’s fun, it’s colorful and just a happy scarf !! Perfect weight for summer too. This is my go-to when I’m out of options (or when my inner teenager frets and yells “I can’t find anything to wear!”). I have the blue/green, which matches nearly three quarters of my wardrobe. 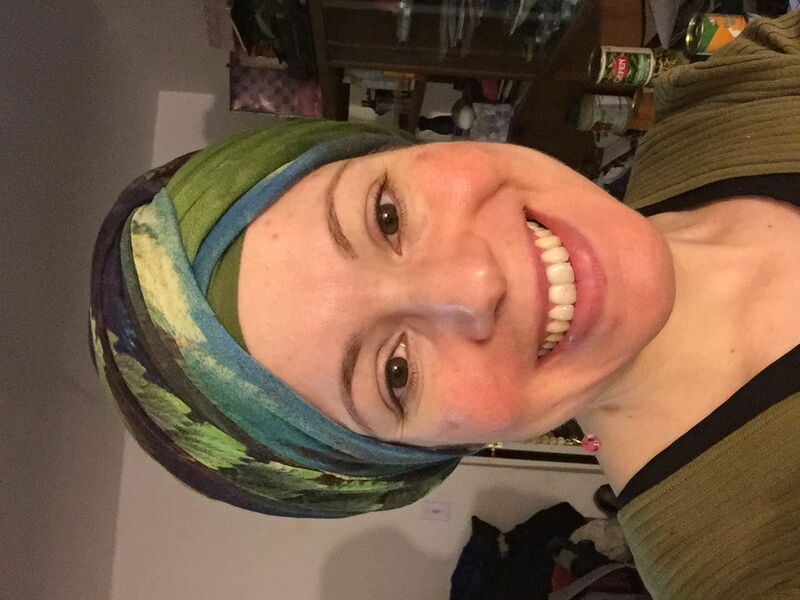 It’s easy to wrap and has so many options for color matching with other scarves. My favorite is pairing it with a solid rust color scarf (pulls out the highlights on the tails) and the orange sequin headband I got here at Wrapunzel. It also looks beautiful with the dark teal 2-in-1. If you’re on the fence, just go for it; you won’t be disappointed! Super lightweight scarf and so stunning! I have the red and adore it! Large, easy to wrap, and the colors are just amazing! This is one of my favorite prints. Here, it’s layered with my olive 2-in-1. This is a very beautiful and agreeable scarf. Light, soft and easy to wrap. I love the pattern especially in tails. I already have the red one and I have ordered the green one, too. I have this in green and it is one of my favorite scarves! I was intimidated at first by the bold pattern on the ends, but after seeing it wrapped on so many women in all different ways on the Fangroup (and loving it EVERY time!) it ended up on the top of my purchase list. I still swoon whenever I see it on someone’s head in the Fangroup, and it looks gorgeous every time I wear it. My biggest problem is that I worry whether I am highlighting its beauty ENOUGH when I wrap it. I just remind myself that I’ve never seen it look bad, so I’m not going to be the first to mess it up! Surprisingly versatile, this looks quite different depending how you style it. 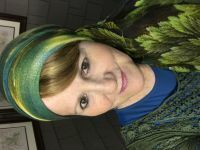 Of course it is beautiful worn with tails, as in the product photos, but it is also great in a regal wrap or a turban. Layering it with different coloured second scarves can changes the look completely, bringing out different shades. And the lightness, softness and natural pattern make you look and feel beautifully serene. I have this scarf in the red variation- one of the reasons that this scarf is so amazing is the colors blend in really nicely together- they are not too saturated and flashy. If you like a softer look, this is definitely a great scarf to have! It also has a nice amount of stretch and is a very soft material. When I wear it- I forget I’m wearing something on my head! The colors and patterns in this scarf make it look absolutely stunning on its on–whether with tails or in a regal wrap. It also seems to look perfect with almost every 2in1 and pashmina I own (including not only the solids but the semi-solids like the Lakeshore Bliss). As someone who doesn’t like a lot of weight on my head, this scarf is indeed a dream! 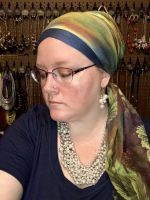 The large size makes it perfect for intricate wraps, and the pattern is beautiful and eye catching! 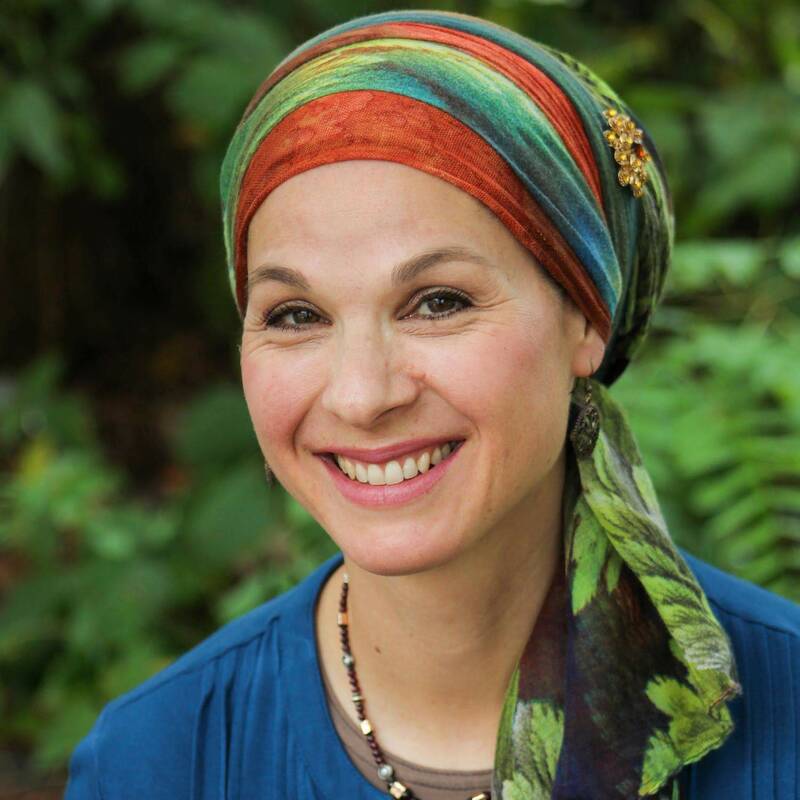 This gorgeous tichel is just like a painting. My husband saw it and loved it so much. He said it was the most beautiful one I had. I have this one in the Blue/Green color (though it has a bunch of other colors) and just love it, especially in a chignon or with a tail or 2 hanging down. It never fails to impress and it is just so huge, soft and gorgeous! It’s soft and beautiful and I love it…4 stars only because I expected the yellow in the middle of the scarf to be brighter, based on the pictures. (I bought purple and yellow.) It’s gorgeous and watercolor-like, yes, but the middle is a bit like a muddy watercolor on my particular scarf. I am still going to wear the heck out of it, but not with the bright yellow shirt I had intended to match with it! It’s honestly difficult to put into words how beautiful this scarf is! It also makes me think of a peacock, the colours are just incredible. 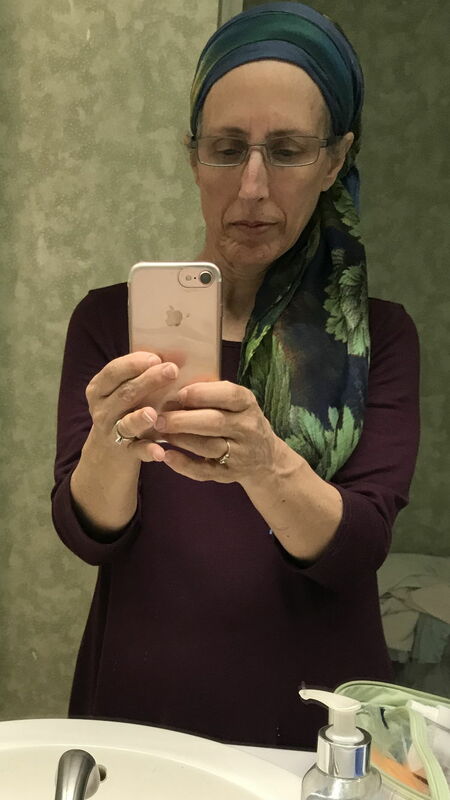 I’ve struggled quite a lot with covering my hair since I got married 8 months ago but this scarf truly makes me feel like a beautiful queen, I can’t recommend it enough! This scarf is slightly shorter than the 2-in-1s, but I can wear it in every basic wrap that I normally use including the chignon. When I tried the chignon, my daughter asked me how many scarves I was wearing and she was surprised when I told her that it was only one. 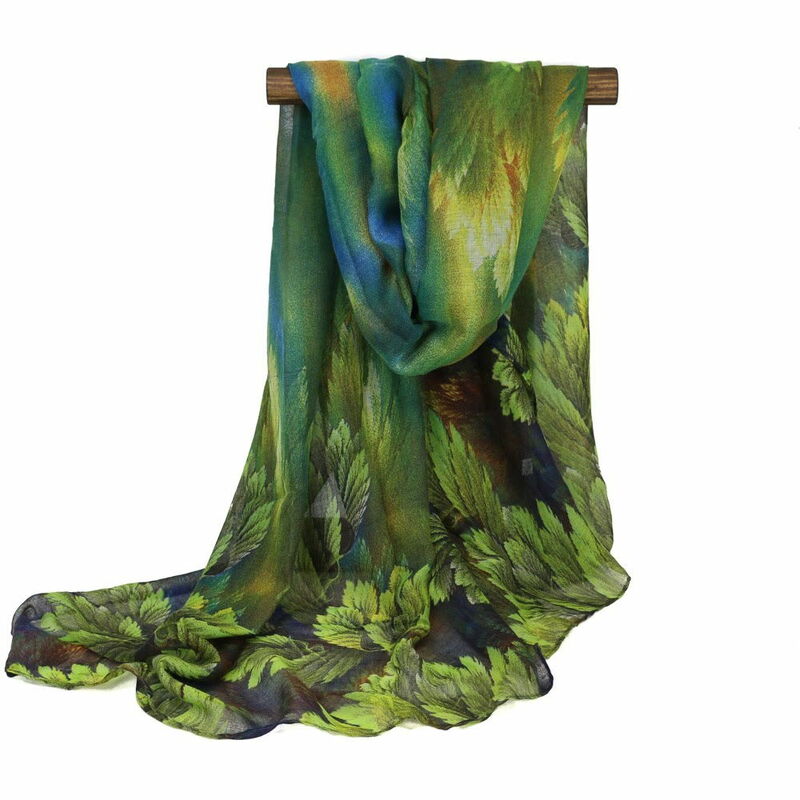 This scarf in blue/green is now tied with the Woodlands scarf for my favorite print scarf. I’m not the only one who constantly touches it when I’m wearing it 🙂 it is super soft! I just had to review this new scarf, despite receiving it so recently. It is too fabulous for words, which become inadequate when I try to explain how wonderful it is. So, I decided to describe it to you, yes, but also tell you how I feel about it and when I wear it. It is my favourite scarf for sure and I am not surprised it is Andrea’s new favourite. It is really, really, really beautiful!! Soft, strong, voluminous, light viscose, the perfect choice for summer. But it is the colour and pattern which really attracts …… when I saw it first I thought it looked like a peacock with its tail all fanned out, and I still think that. Teal, Green, Yellow, Rich, Rich Royal Navy’ish Peacock Blue, Brown in an intricate feathery leaf pattern that does (in my opinion anyways) resemble a fanned out Peacock’s tail. I knew immediately I just HAD to have one. And I LOVE it!!!!!! I love how it looks and how it feels on my head. In fact I touch it all the time I am wearing it. It is an amazing headscarf. I have matched it thus far with my olive 2 in one, my dark brown 2 in one and my very favourite pashmina …. dark Rivka Malka’s teal. I purchased a teal shimmery to wear with this scarf for special occasions and two peacock brooches. I love it so so much, I am going to order a second one in the same colour in case it snags and so I have a perfect one to wear for special wear. I am also going to purchase every colour available. I cannot praise this tichel highly enough. I give it Ten Stars!! It is so sumptously gorgeous!!!!!! It makes me feel like a Princess just to put it on my head. My only advice …… BUY IT NOW!!!!!!! You will only be dissappointed if you don’t!!!!!! ??? ?